One of the major festivals of Hindus in Nepal, Dashain is celebrated with joy and happiness all over the country. The festival falls on the tenth day, after the nine days of Navaratri or Nauratha. According to the legends, on this day, Goddess Durga is said to have killed the powerful demon Mahishashura marking the victory of good over evil. It is also said that on this very day, Lord Rama had killed the demon Ravana. Thus, this festival is a reminder of the continuous victory of good over evil and during the festival, people forget their jealously and egos and celebrate it with joy and happiness. 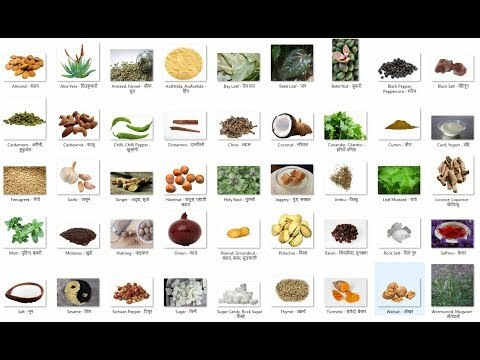 Many people living away from their home get a chance to return home on long holidays and the festival is celebrated by taking the blessings from the elders in form of Aksheta or Tika. The festival lasts for fifteen days, the first nine days are called Nauratha when the various forms of goddess Durga are worshiped in the temples around the country, the tenth day is Dashain and the last five days are celebrated by visiting the relatives for receiving their blessings. Also, the swings namely, Linge ping, are hung at various empty field during the festival. Tika and Jamara kept ready before sitting for receiving Dashai Tika from the elders. 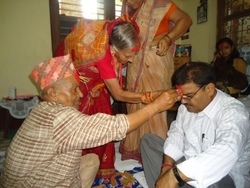 Receiving Tika from the elders. -->Usually the tika is not received empty-handed and the same thing is followed while putting tika to the youngers" src="http://bossnepal.com/wp-content/uploads/receiving-blessing.jpg" width="500" height="375" srcset="http://bossnepal.com/wp-content/uploads/receiving-blessing.jpg 500w, http://bossnepal.com/wp-content/uploads/receiving-blessing-200x150.jpg 200w" sizes="(max-width: 500px) 100vw, 500px" /> Giving sagun to the elders. Usually the tika is not received empty-handed and the same thing is followed while putting tika to the younger. Two sisters putting tika on each other’s forehead. Usually it is the elder sister who puts tika on her younger sister’s forehead as a blessing. 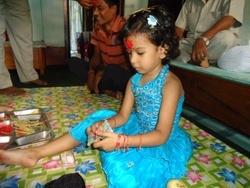 A little girl counting her Dakshina (the money given to the younger girls as a blessing along with tika). 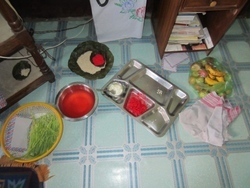 Usually the elder members give Dakshina to the daughters in the family. Young man swinging on a Linge ping. 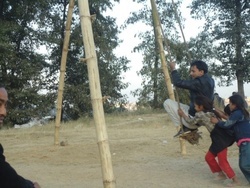 The swings like this are constructed at various empty fields and also in front of the temples during the festival of Dashain.